Good News, Pompeii! The Snack Bar Is Open Again! Call it a grand reopening under extremely new management. 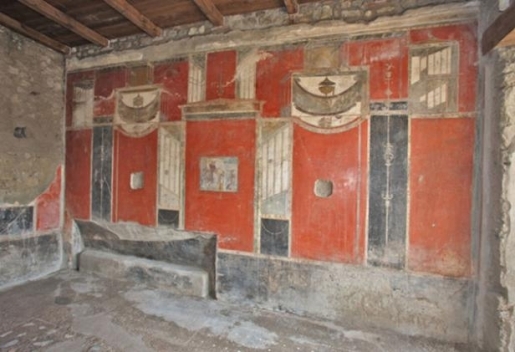 After nearly 2000 years, the thermopolium, or ancient Roman snack bar, in one of the best-preserved buildings in Pompeii will be reopened to the public and serving snacks again! Someone turn on the Hot Doughnuts Now sign, because the Mt. Vesuvius Snack Bar and Grill is now open! The business was temporarily shuttered after original owner Vetutius Placidus was buried beneath a few tons of volcanic ash and boiling hot lava. Starting this week, visitors will once again be able to see just how Romans indulged their sweet-tooths, though the authentic Roman snacks are for the opening ceremonies only. The building had been closed for several years for extensive renovation and restoration. Like any history nerd, though… wouldn’t it be awesome if they could keep the snack bar open not just as a tourist destination, but as a snack bar? Just how cool would it be to stop in and pick up some honey cheesecake and chilled grappa, or whatever Romans drank back in the day with their sugary treats?